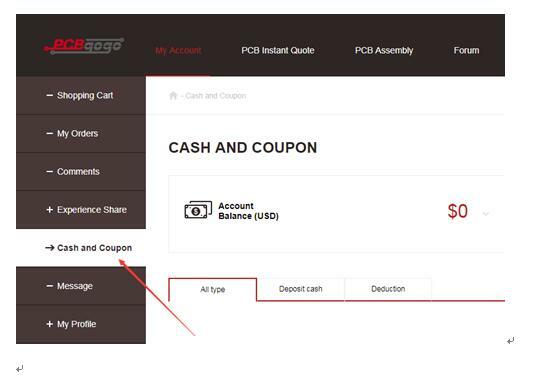 From time to time and for certain events, we may give out some coupon codes for a discount on your PCB and PCBA order. If you have a valid coupon code, you can redeem and use it when viewing your shopping cart, or during your checkout process, here is how to redeem your coupon. 2.sign in your account in the upper-right hand corner of the site. 3.Click on the My Account page and select “ Cash and Coupon”. 4.Click “ Discount Coupon” button on the right-hand side of the page. 5.Rnter your coupon code and click “Apply to your balance ”. 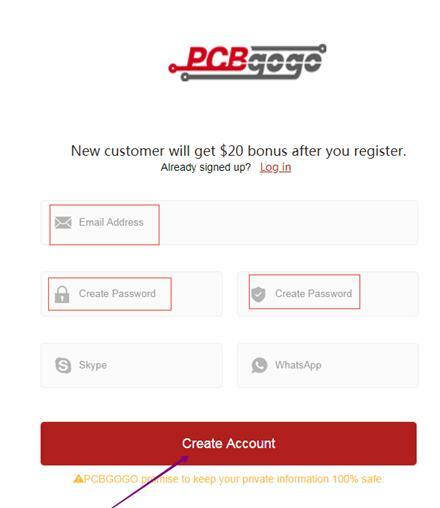 If you're still having issues with your coupon, please send an email to services@pcbgogo.com before you complete your order and we would be happy to help you. 1)You can use the coupon from 13 November to 15 December, 2018. 2)The coupons are limited to one per person, non-transferable, and may not be combined with any other coupons. Next：How can I get $50 PCB assembly order on PCBGOGO?